This one, photographed Friday in west Albany, seems to have snagged a meal in its flimsy web. In case you have not noticed, it’s getting close to spider season in western Oregon. But according to what you can learn online, having spiders around is nothing to worry about. 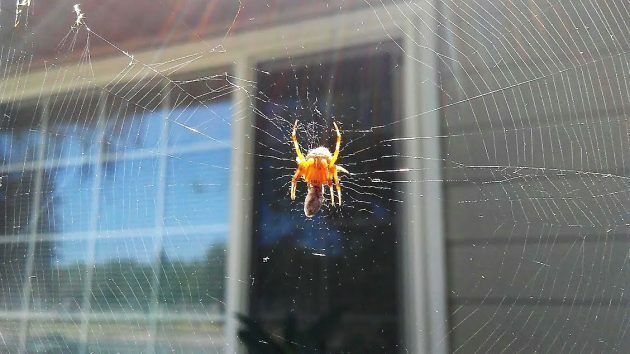 The state Department of Agriculture says Oregon has at least 500 kinds of spiders. And by late summer and early fall, it sometimes seems as though most of them have spun their webs in your yard or around your house. The good news is that spiders are death on insects but not on us. According to the department’s online publications, one of which you can find here, people normally are not bitten unless they come in “very close contact” with a spider. Duh! I guess a spider is not going to get you from across the room. And in the unlikely event that a spider does get you, the effect probably won’t be serious. The Ag Department cites a 2014 study of 33 verified spider bites in Oregon, none of which resulted in significant medical symptoms. Unfortunately, the spider I photographed Friday did not come with a label or ID tag. I compared it with various spider portraits available online. It most resembles a photo of a cross spider taken by someone at Portland State and published online by the Portland Oregonian. What about the dreaded black widow, which is occasionally found in the Willamette Valley? Even though it’s the most potentially harmful spider found in Oregon, the amount of venom you get from a bite is not usually enough to cause a serious reaction in most people. But just to be on the cautious side, ODA says to seek medical attention if you believe a black widow took a bite. In the spirit of the times, let us be more inclusive of spiders. While spiders are scary and creepy to look at, which is why most people have a revulsion to them, by and large they are quite beneficial to our environment. Also, I note you say you assume two bites in a lifetime maximum is a factual statement, when the article you quoted from didn’t say that at all, but more likely an average. I’ve already exceeded my two bites, and I don’t like spiders either, but now when I find one inside my house, I do my best to capture and release out of doors. I don’t kill spiders. I killed enough bugs when I was a kid; I’m long past that. When I find a spider in my house that I think one of my two cats has an eye on, I pick it up and put it in the closed palm of my hand and put it outdoors. Haven’t had a palm bite yet. I think spiders range from pretty to so-so. I don’t think they are scary or creepy. I have been bit at least 5 times. I decided last fall that I would work in the flowers late in the evening and that is when I was bitten 4 of the times 2 places on each arm. I don’t do that again. I saw my doctor and he gave me some medicine which didn’t help with the itching which comes after the bite so I used spray on Cortaid which worked great. When I was a kid I put on some gloves and was bitten on the finger. We lived where there was black widow spiders and was lucky it wasn’t one of those. My Dad was bitten by poison spider and spent some time in hospital when I was quite young. It pays to be careful.